Parents hear these words frequently, and, more often than not they speak them, too. What if there was a way to help our families achieve better overall health without drugs, expensive trips to the pediatrician, or late nights playing Dr. Google? There just may be an answer for the whole family: Chiropractic Care. Some people think chiropractic care during childhood is only for sick kids, but many parents depend on chiropractors for preventative care. Healthcare is seen mostly as responsive to symptoms (You get a cough, you go to the doctor! Have an ear ache? Doctor! Bed-wetting? Pediatrician! ), but being proactive about your family’s health can ensure that they begin their lives as healthy as possible! 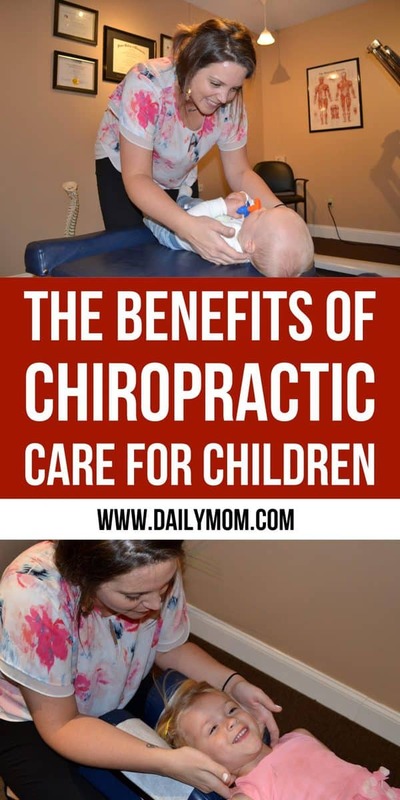 Chiropractic care has been around for a century and a half, but only recently has it become a mainstream path to wellness for families and children. Chiropractic care is safe, effective, and natural-what more could a modern parent want for their family? Dr. Hoeffert shares a testimony from one of her patients: “One of my children experienced bed-wetting when they were 5 years old. We ran out of options and felt stuck. One of our relatives suggested chiropractic care.” Chiropractic care brings to mind middle-aged, stressed-out businessmen going in to have their necks cracked, so when asked if she was nervous to bring in her young child, she responded “Not at all! The moment we walked into the office, Dr. Hoeffert made it a fun experience. She was able to explain to our child that ‘alignment’ just meant that there was air trapped between some bones, and the ‘popping’ sound was just that air being released, and to think of it as a bone fart.” Not only did her child wake up the next morning in a dry bed, but the child felt empowered and safe in this environment of holistic wellness. As in any profession, bedside manner differs from practitioner to practitioner, but if parents find a chiropractor that can bring the scary “popping” sounds down to a “bone fart” level, while making the appointment fun and child-friendly, you may have found your chiro-match. Pregnancy isn’t just rough for the mothers, but can put pressure on baby, too. Babies are born after being cramped for months, and can experience trouble latching, sleeping, and colic. If you are experiencing this with your child, a chiropractic check may help you. These checks, either as needed or every few months, can help to make sure the spine is in proper alignment and grow healthy habits. It is far better to grow healthy kids than to repair damaged adults! Peer-reviewed research shows the body’s immune system is boosted anywhere between 50 – 200% for 48 hours post adjustment. Our t-fighter cells are working their best and doing everything they need to (and were designed to) to keep sickness at bay. The nervous system controls the immune system, so getting chiropractic adjustments and keeping your “command center” functioning at top speed, is an essential part of staying healthy and battling anything that is “going around school/daycare/the office”. Wash your hands – be vigilant! Some insurance companies cover chiropractic care, so call your insurance company for some guidance at the beginning. Many offices are adopting the “cash pay” system, and can be refreshingly affordable for you and your family. As in any medical profession, there will be good fits, and not-so-great fits. Word of mouth is also a great way to go when shopping for your children/family’s chiropractor. In this Mama’s experience, I’d suggest getting an alignment a few times before you bring your children in, so that you can explain to them what to expect, but also to see for yourself the long-term benefits of this holistic practice. Check out Adjusting for Labor: Prenatal Chiropractic Care.